“Broken Shadows” is four choruses of an AABA dirge. During the first three choruses, two of the horns play the melody while the third improvises. Between the melody and Charlie Haden, a consonant chord structure is strongly implied. However, none of the soloists relate to the “chords,” instead pursuing melodies that have only their own logic, not the logic of any normal harmony. Like all of Ornette’s music with multiple horns, the texture on “Broken Shadows” is just ragged enough that you can hear each player phrase the tune his own way. But the emotion is absolutely unified, especially since all the horns are playing very loud all the time. There is not really “figure and ground” between the soloists and the other horns here, instead just communal mourning. In the last chorus, the feeling intensifies as the horns play the tune harmolodic style, as if they are all reading off one chart without transposing, or at least getting to pick the harmony they want as long as the shape of the tune is preserved. 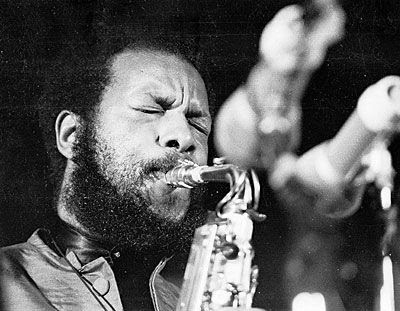 Usually Ornette would have either Don Cherry or Dewey Redman playing with him, but Crisis is a rare and wonderful example of all three men onstage together. Charlie is grim and resolute, barely changing his bowed bass line during the four choruses.